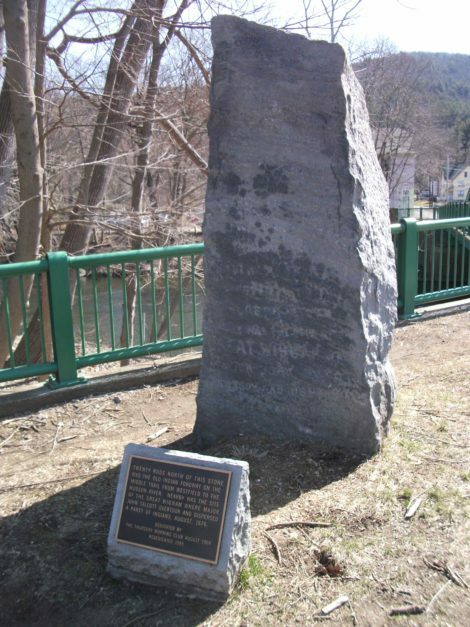 The Talcott Raid stone in Great Barrington at the Bridge Street bridge is in a visible location though it does not necessarily convey accurate information. 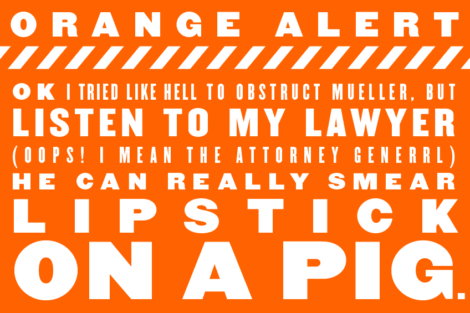 And many people may not have even noticed it. 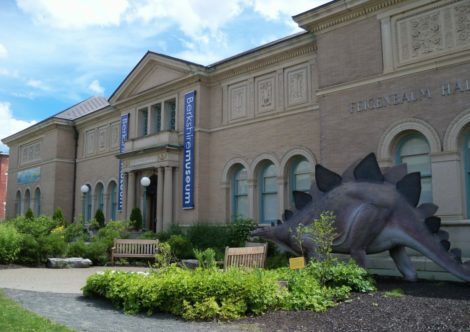 Local historians thrive on discovering stories of the past and sharing them. Consequently South Berkshire communities commemorate several landmark events, dynamic personalities and once-thriving industries with bronze or stone markers. Most are prominent; some are obscured. Accuracy isn’t always uppermost in placing signs or shaping words on the signs. Consider this a quiz: How many of these markers have you seen? 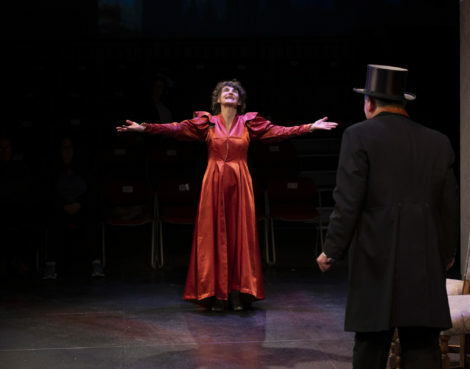 Members of Great Barrington’s Thursday Morning Club in 1904 accepted town historian Charles J. Taylor’s belief that the Indian fordway at the Housatonic River in Great Barrington was at the foot of Bridge Street and put up a stone. The stone is often seen, never read anymore. That’s because the lettering wore off over the decades. So a replacement bronze plaque was put up. 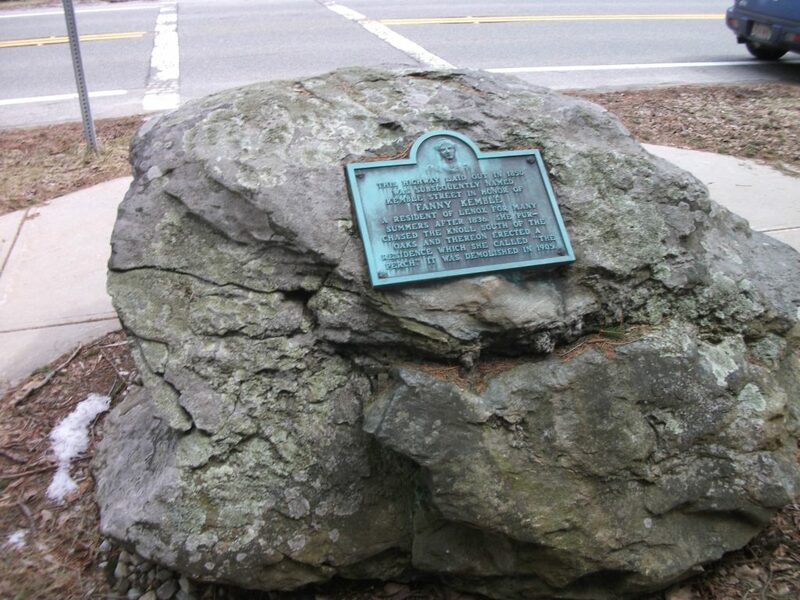 Twenty rods north of this stone was the old Indian Fordway on the middle trail from Westfield to the Hudson River. Nearby was the site of the Great Wigwam where Major John Talcott overtook and dispersed a party of Indians, August, 1676. Dedicated by the Thursday Morning Club August 1904. Rededicated 1989. This is a curious marker in several respects. First, its placement is dubious. Documents from the 17thcentury are inconclusive; the Talcott confrontation could have taken place in Sheffield or Salisbury. Taylor wanted to have the story of Talcott and the Connecticut militia’s pursuit of fleeing remnants of King Philip’s outraged Indians part of the town’s history, so he pointed to this spot. Projectile points had been recovered from ground behind First Congregational Church, after all. But there’s no documentary or topographic evidence of a fordway having been located in this spot. In fact, early writings and the terrain suggest the Housatonic River crossing was at the Great Bridge. If the ancient roadway had gone to Bridge Street, an imprint would still be there in the soil. Surface compaction doesn’t disappear except beneath pavement. East Street originally went along Quarry Street and south to Sheffield. It didn’t connect to the bridge until a Bridge Street bridge was built in the 1870s. Second, why commemorate this event? “Dispersed” is a quaint way of saying “overpowered and killed.” The at-times brutal King Philip’s War was over. The Connecticut militia was out for blood. These Indians were fleeing for their lives and of no particular threat — certainly not in Great Barrington, which had no white inhabitants. Why are we honoring a massacre? On the other hand, how many monuments are there to Native American maltreatment? It’s a rare admission of how fiercely we wrestled New England from its indigenous people. The Green River cast iron sign has disappeared from Route 23 in Great Barrington. 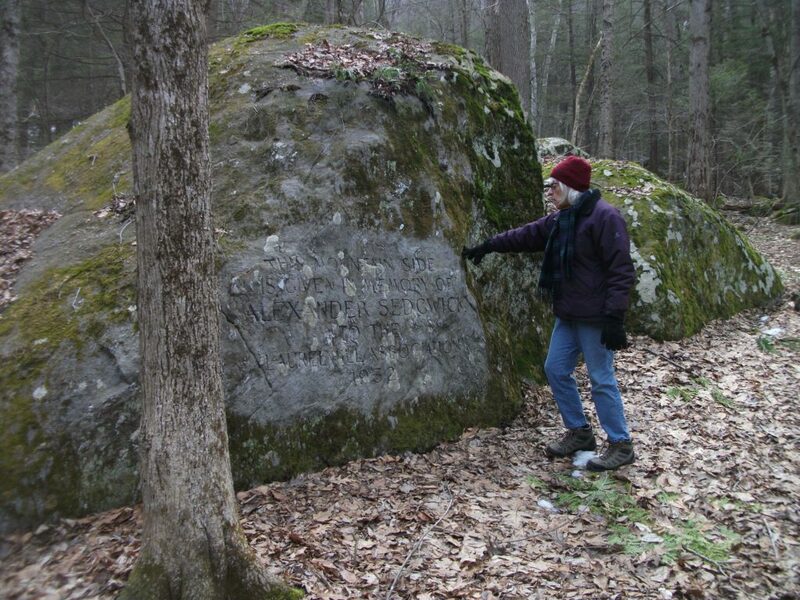 A marker near Green River on Route 23 in Great Barrington has disappeared — perhaps stolen, perhaps sacrificed to a World War II scrap drive. It was a cast-iron sign, one of many dozens installed by the commonwealth in 1930 to mark its tercentenary. Although New York state has managed to keep most of its similar historical markers, ones in Massachusetts have largely vanished. Green River. Where General Amherst and troops camped enroute to Ticonderoga 1758. 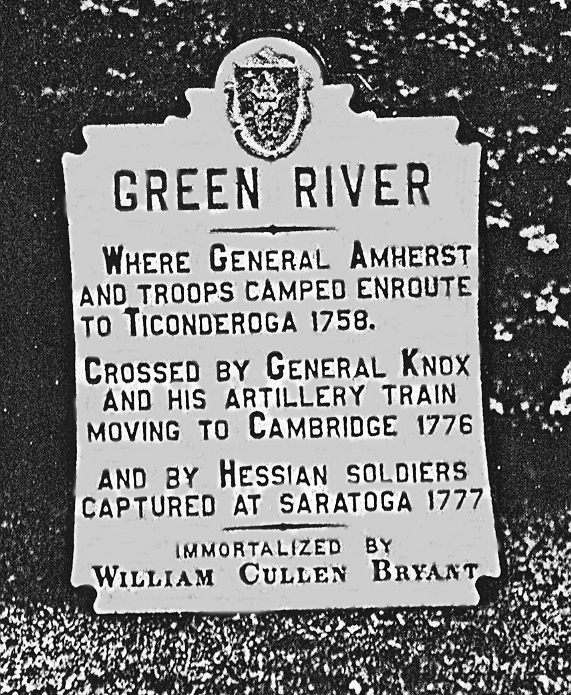 Crossed by General Knox and his artillery train moving to Cambridge 1776. And by Hessian soldiers captured at Saratoga 1777. Immortalized by William Cullen Bryant. The site is important to regional history, if not national and international. Amherst’s Pioneers — the equivalent to the Army Corps of Engineers — widened and improved the old east-west Indian pathway for security. It became a major route for future militiamen, military suppliers and emigrants to the Berkshire Valley. Amherst, while encamped here, met with Stockbridge Mohican leaders who wanted to re-enlist in the famed Rogers Rangers. Amherst didn’t object. But he was ambivalent about Indians, and later in the conflict — there’s no absolute documentary proof, but it seems certain — condoned smallpox-contaminated materials be circulated among Indians. Germ warfare. Here’s a case of Amherst being good (for the British) and bad (for the Indians). But the Mohicans were good. So both deserve mention. The sign actually included quite a bit of misinformation. Ticonderoga was called Fort Carillon at the time. Knox was slogging his cannon/mortar/cohorn-laden oxen sleds to Dorchester Heights in South Boston. It was Brunswicker, not Hessian, soldiers who passed through during the Revolutionary War. Bryant did write a poem about Green River, though it is disputed whether it was about the Green River in Great Barrington or Green River in Williamstown, where he attended college. 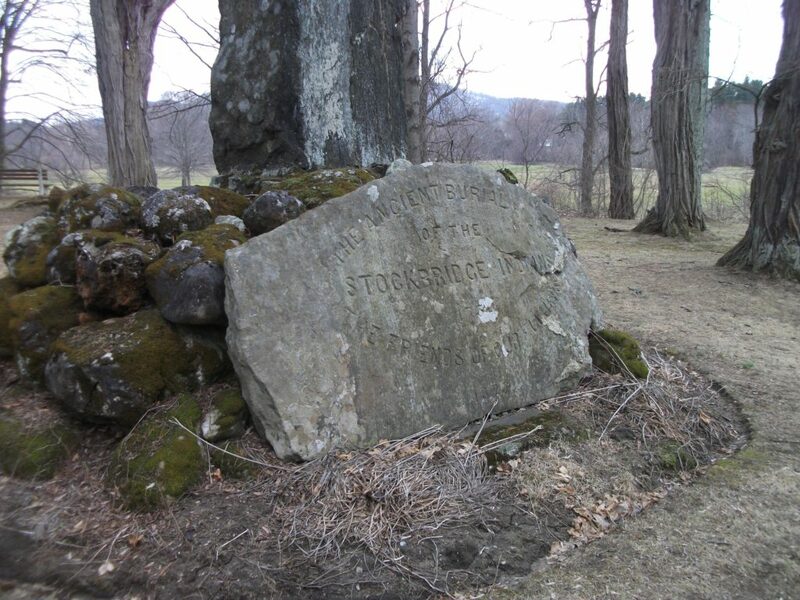 The ancient burial ground of the Stockbridge Indians 1739 The friends of our fathers 1877. 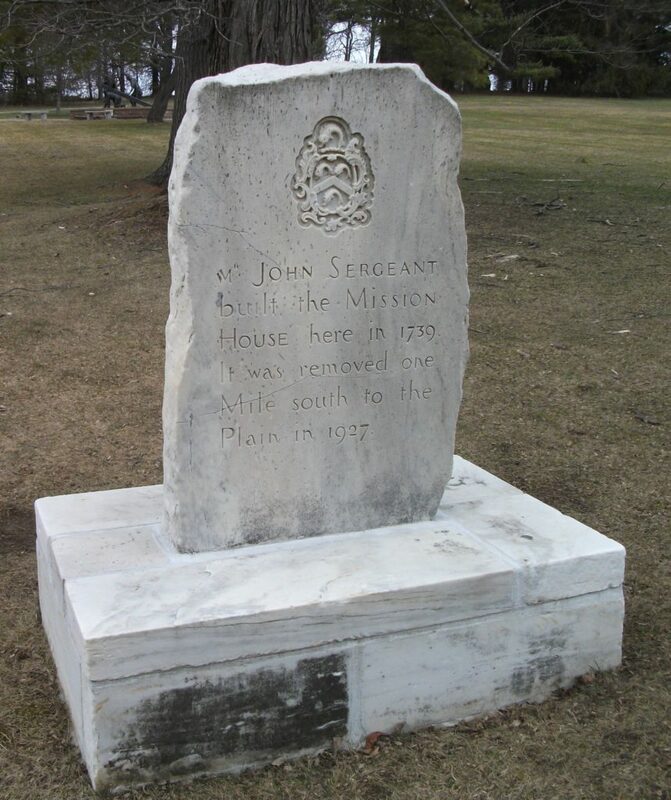 John Sergeant built the Mission House here in 1739. It was removed one Mile south to the Plain in 1927. 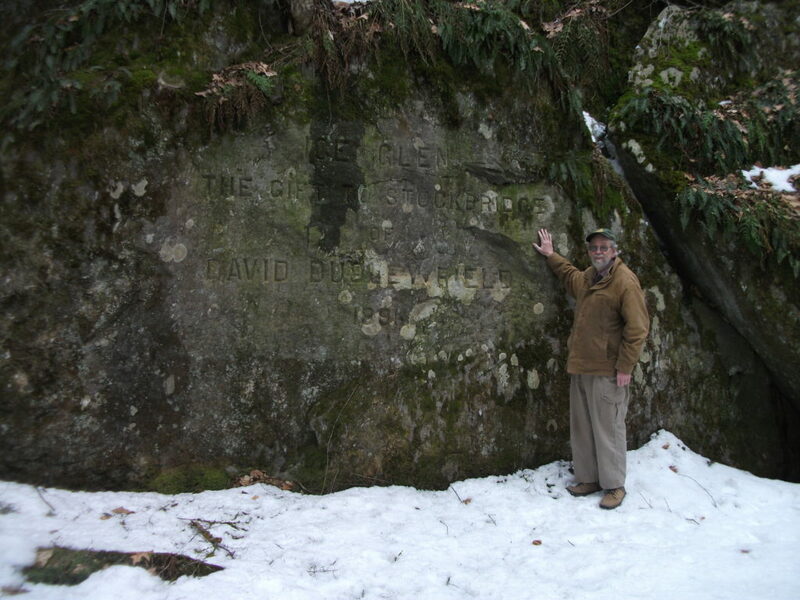 Stockbridgers preferred site over visibility in the placement of two rock inscriptions. Attorney and reformer David Dudley Field Jr. gave Ice Glen to the residents of Stockbridge. Ice Glen the Gift to Stockbridge of David Dudley Field 1891. This mountain side is given in Memory of Alexander Sedgwick to the Laurel Hill Association 1932. “Aleck” Sedgwick (1867-1929) attended Bishop’s College in Quebec and lived for many years in his great-grandfather Theodore Sedgwick’s home on Main Street. A Democrat, he served in the Massachusetts General Court. He was an ambulance driver in Italy during World War I. He was a president of Laurel Hill Association. His widow, Lydia C.R. Sedgwick, gave the land as a memorial to her late husband. 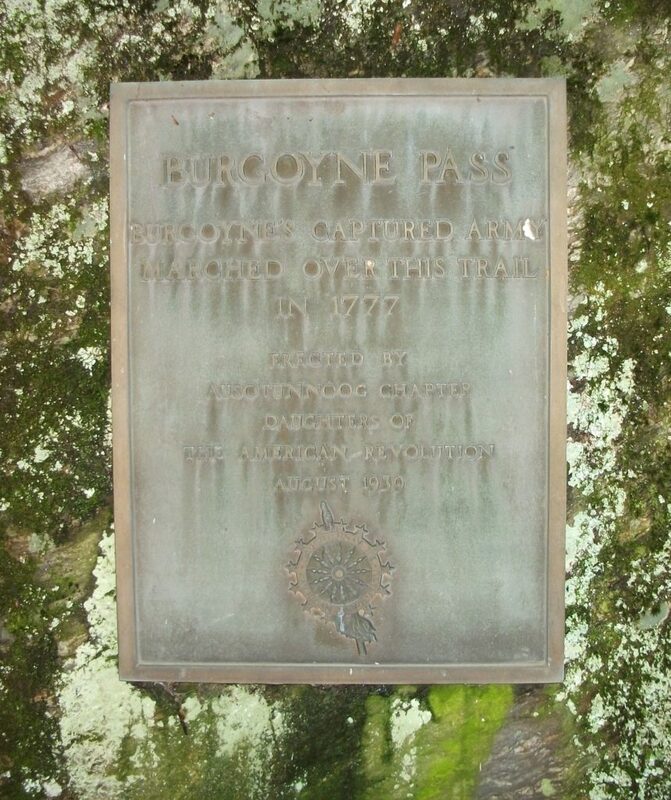 Burgoyne Pass [Gen. John] Burgoyne’s captured army marched over this trail in 1777. Erected by Ausotunnoog Chapter Daughters of the American Revolution August 1939. This wording is accurate, though you should know some of that captive army trod through Great Barrington. But who, pray tell, has ever seen this tribute? Bon vivant Cortlandt Field Bishop (1870-1935) was a one-man marker maniac, responsible for placing four bronzes in Lenox. One is obvious on the roadside in front of the Nathaniel Hawthorne’s Red Cottage replica above Lake Mahkennac. To be precise, the cottage and 1929 marker are across from Tanglewood’s Lion’s Gate in north Stockbridge, not Lenox. The highway laid out in 1850 was subsequently named Kemble Street in honor of Fanny Kemble a resident of Lenox for many summers after 1836. She purchased the knoll south of the oaks and thereon erected a residence which she called “The Perch.” It was demolished in 1905. 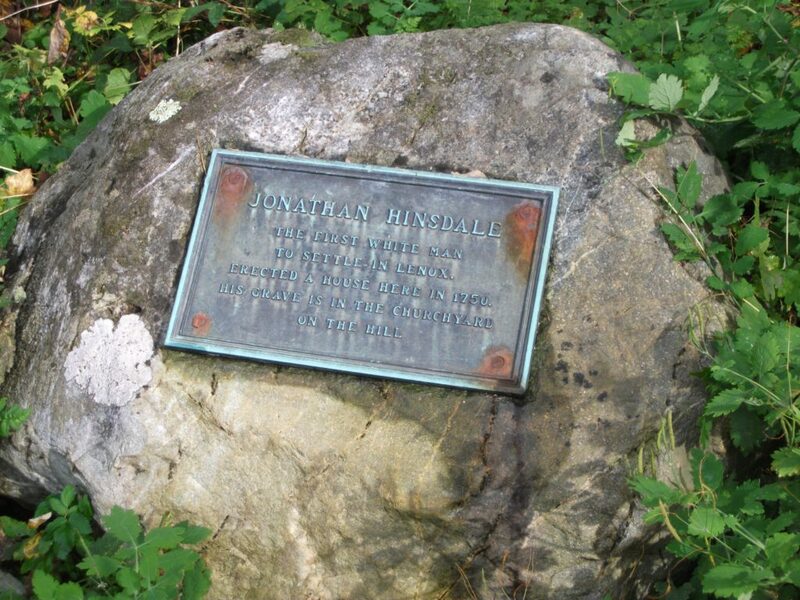 Jonathan Hinsdale The first white man to settle in Lenox. Erected a house here in 1750. His grave is in the churchyard on the hill. In 1770 a tavern was erected on this site by Captain Charles Dibble who answered the call of April 19th1775. It was situated on the highway running north as laid out by royal authority in 1751. At a later period the tavern was used as a jail. What Bishop omitted — and was fully aware of — was the story of Columbus the traveling menagerie elephant. Injured after falling through a bridge in Adams in October 1851, the beast from India was en route to an appearance in Stockbridge when he collapsed across from the Elm Court (not-yet-built) entrance. 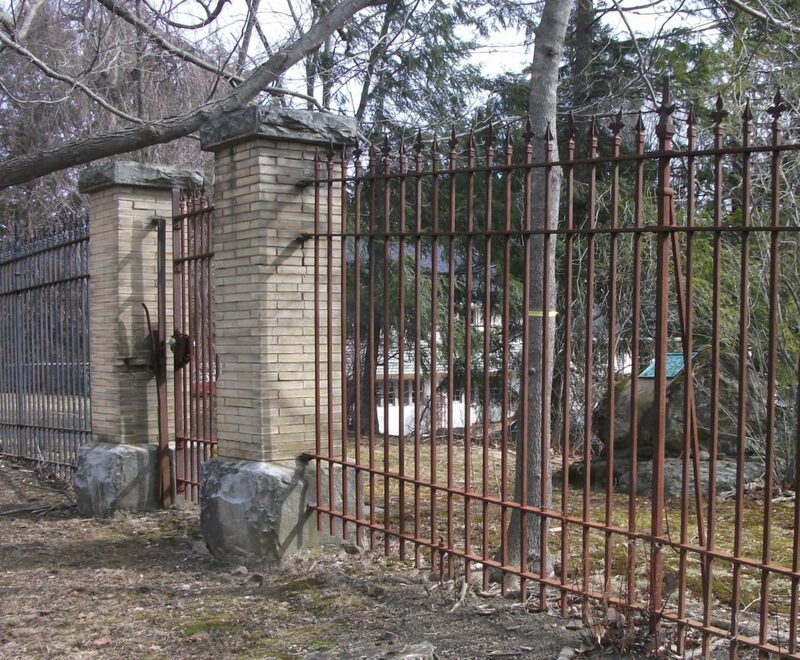 The elephant was wrestled into a barn and died on the Butler premises — and was buried on this very property. How did you score? How many of these signs have you seen in your travels? Omit the Green River marker; no one has seen that for years. The others still exist. If you have viewed 1-3, you’re average; 4-6, you look at roadsides as you drive; 7-8, you wear hiking shoes; 9, you are a true explorer! No mention of the Shay’s Rebellion marker in Egremont? I always found its unassuming location to be quaint and understated for such an auspicious event. FIRST: The present system of taxation operates unfairly between the poor and the wealthy classes. SECOND: The tax rates have been set too high. THIRD: There is a shortage of cash money, and farm goods are not accepted as payment for debts and taxes. FOURTH: Court and lawyer fees are set too high. FIFTH: State government officials are being paid fattened salaries. SIXTH: The state capital at Boston should be moved inland. I consider the Shays’ Rebellion marker, on the actual battlefield, to be a very appropriate location, visible from the town road. Newly straightened, it is one of the few such monuments right on the Appalachian Trail — a history lesson for the thru-hikers and others.